Our columnist discovers four stunning properties that illustrate how superb design can mesh seamlessly with cleaner air and greener living. But most remarkable of all is what these homes do NOT have: loads of VOCs and respiratory triggers. 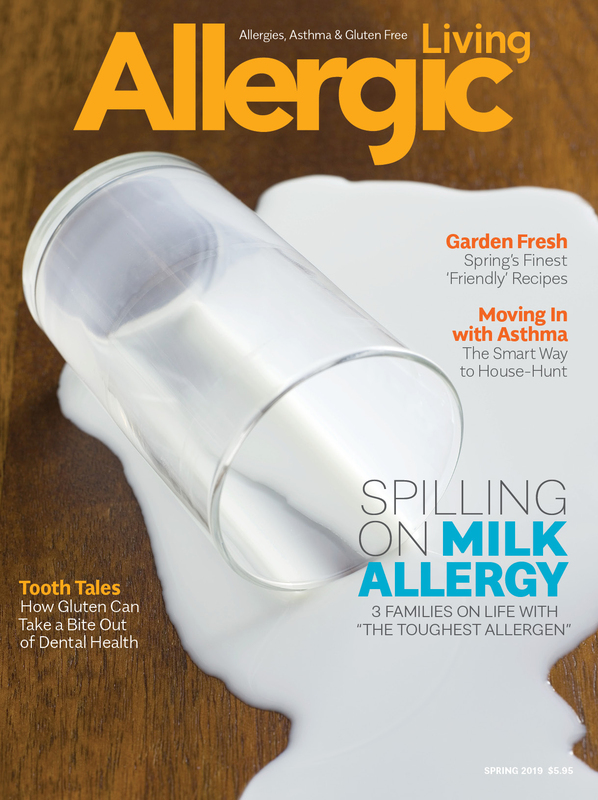 See more healthy home articles in Allergic Living magazine; to subscribe click here. He is a Seattle builder who tries to push the envelope of green design; she runs a top public relations firm in the bustling seaside city. So when Sloan Ritchie and Jennifer Karkar Ritchie set out to design and build their own home, they wanted it to be a model of sustainable, healthy living. The pair opted for a passive house, a building style that is increasingly common in Europe and is now gaining popularity in North America. Put simply, these are ultra-low energy buildings that require almost no heating or cooling, and use almost no energy from fossil fuels to heat air or water. In fact, the Park Passive home’s heating system, when turned up to high, only consumes about the same amount of electricity as a hair dryer. 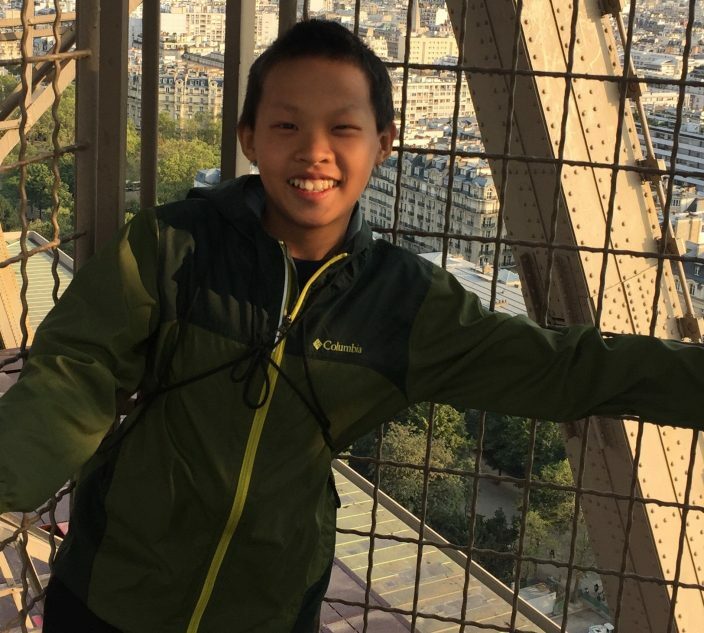 That’s no small feat: especially in a wet, chilly climate like Seattle, it meant triple-paned windows, plenty of insulation – in some spaces up to 28 inches thick – and a complex ventilation system. But the design wasn’t just about going green. With two young kids, the couple also wanted to ensure the home was as healthy as possible. And while many expect that level of green to take a big bite out of their budgets, Sloan Ritchie says it only cost roughly 5 to 10 percent more than a conventional house – and energy bills are a fraction of what they used to pay. Heating/Cooling/Air Filtering: Because the home is so tightly sealed for energy efficiency, a top-notch ventilation system was essential. There are actually two systems: a ductless mini-split (or heat pump), which uses roughly two-thirds less energy than a typical heating system, as well as a heat recovery Ventilator, or HRV that continuously delivers fresh, filtered air in and exhausts stale air out. Flooring: On the ground level, the pair opted for polished concrete – a durable surface that requires no maintenance, offers a sleek, timeless look, and avoids the dust mites, mold and VOCs (volatile organic compounds) that come with carpeting. The stairs are hardwood, taken from an ash tree that had to be removed from the site, and that the pair had milled. Upstairs, the flooring is solid bamboo, with ceramic tile in the bathrooms. Wall Finishes: The walls are gypsum board (or drywall), painted with Sherwin Williams’ ProMar 200 – a professional-grade zero-VOC interior paint. Some accent walls also feature wood panels made from the ash tree removed from the site. Insulation: The main aim of a passive house is to limit energy use, so insulation is key. 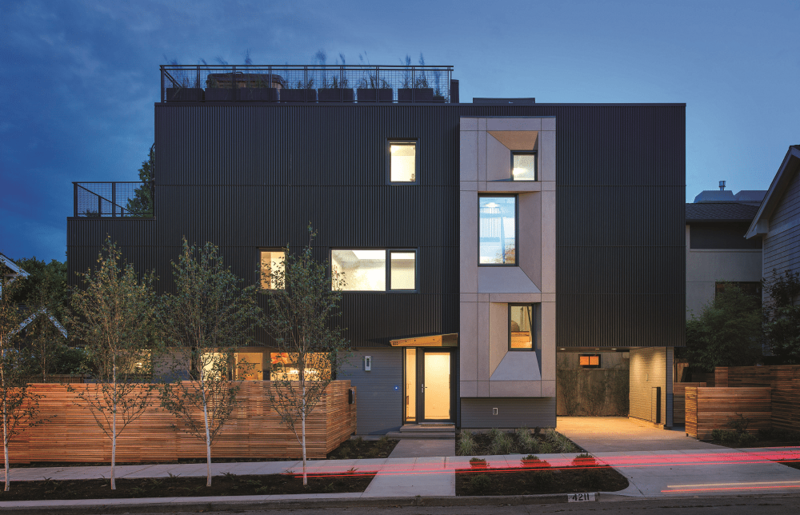 The Park Passive house features a whopping eight inches of EPS foam insulation underneath the slab foundation, as well as blown-in dense-pack fiberglass in the walls. There’s also a 5.5-inch layer of dense-pack fiberglass insulation on the interior wall, and another nine inches to the exterior, for a total of 15 inches. And while fiberglass often gets a bad rap for its formaldehyde content, Ritchie made sure theirs was formaldehyde-free. Extras: The three-story modern home also features a day-lit open stairwell, double-height vaulted kitchen ceilings and an open floor plan. But what’s really jaw-dropping is the efficiency: it uses 90 percent less energy than a typical home. It was eight years ago that Jan Flanzer discovered her house north of New York City was contaminated with toxic mold – an infestation that left her and her family sick, sensitive to indoor pollutants, and seeking a healthy home. That search turned into a Scarsdale-based business called Healthy Home Builders, and now Planzer, along with contractor Peter Donovan, have made it their life’s work to build homes that are focused on clean air, pure water and cost-saving energy. 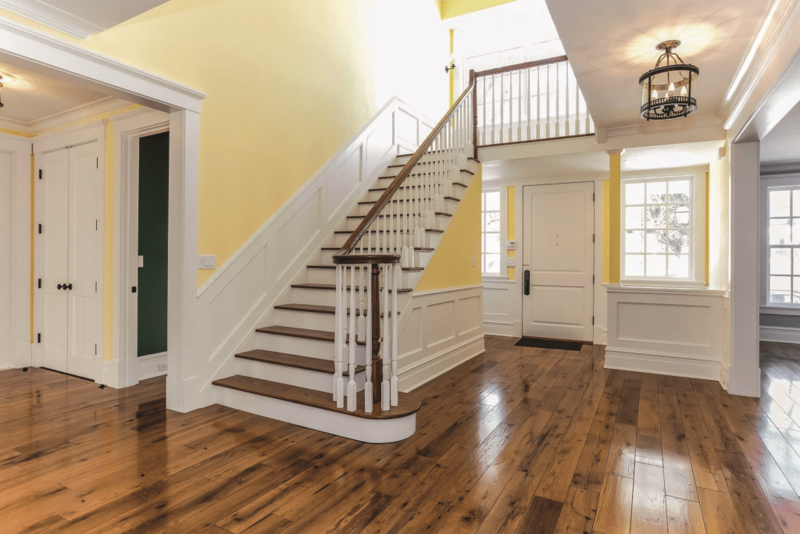 Kent Road is a six-bedroom, seven-bath, colonial-style home that has a warm, traditional look, but inside the home also offers state-of-the-art technology that maximizes energy efficiency, water purity, and above all, air quality. Heating/Cooling/Air Filtering: The house features whole-home HEPA filtration and an energy recovery ventilation (ERV) system that ensures a steady supply of fresh, filtered air. A garage exhaust ventilation system also keeps carbon monoxide, benzene and other harmful elements of car exhaust from entering the home. Solid maple cabinets are free of finishes. Flooring: The flooring is primarily reclaimed oak from a company called Reclaiming The Past, based near Memphis, Tennessee, which refinishes wood from old buildings and barns. It’s tinted with a chestnut stain rated zero for VOCs, and coated with a safe substitute for polyurethane called StreetShoe. In the bathrooms and hallways, the designers used stone, ceramic tile and slate. Cabinets and Counters: All of the cabinets were custom-made from solid maple in upstate New York – minus any harmful stains and coatings. “Cabinetry is usually the most dangerous, in terms of reactions and toxins, because if it’s not custom cabinetry that’s solid wood, it can have toxic glues and formaldehyde,” says Flanzer, “and that is just brutal to off-gas.” The countertops are made from Absolute Black granite. Floors are built from reclaimed wood with chestnut stain rated zero for VOCs. Wall Finishes: For paints, the designers opted for Benjamin Moore Ultra Spec 500. “We found that Benjamin Moore is the best with the zero-VOC paints and primers,” Flanzer says. Underneath is a special mold-resistant drywall by National Gypsum. Insulation: Recycled denim insulation by UltraTouch was the insulation of choice, both because it doesn’t contain harmful chemicals, and because it provides great sound deadening. 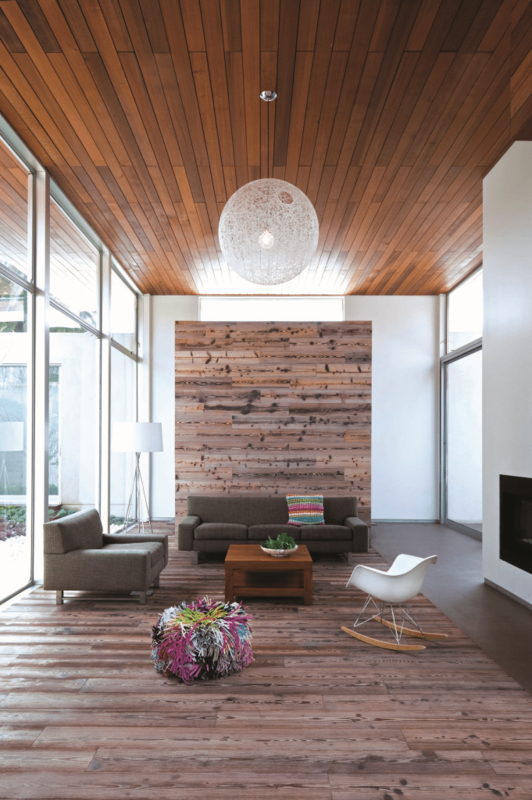 Elsewhere in the home, the designers used blown-in cellulose, a non-toxic insulation made from recycled newspaper. Extras: The home has a host of other features, among them a solar hot-water heating system, a whole-home carbon water filtration system, and a cistern for collecting and recycling rainwater. Featuring canals, beaches, palm trees and the legendary Ocean Front Walk, Venice, California has no shortage of natural beauty – and that was a big part of the focus when Iceland-born, Santa Monica-based architects Tryggvi Thorsteinsson and Erla Dögg Ingjaldsdóttir of the company Minarc set out to create Appleton Living. The home is oriented so that all the rooms enjoy the stunning outdoor living space, which includes a pool, an outdoor dining area, barbecue and play court. But it’s not all about aesthetic appeal; the house was designed to take full advantage of passive solar principles, as well as natural ventilation. And while its look is decidedly modern, natural elements such as wood and stone bring it back down to earth, giving it a warm, inviting feel. It also had to be extra durable, functional, livable and easy to clean, because the clients are a busy family of six who also foster rescue dogs and other furry friends. Heating/Cooling/Air Filtering: What’s most amazing about the heating and cooling at Appleton Living is that there is almost no such system – except for what nature provides. Solar panels on the roof heat the water that travels through the in-floor radiant heating system, and there’s enough energy left over to warm all of the family’s hot water. 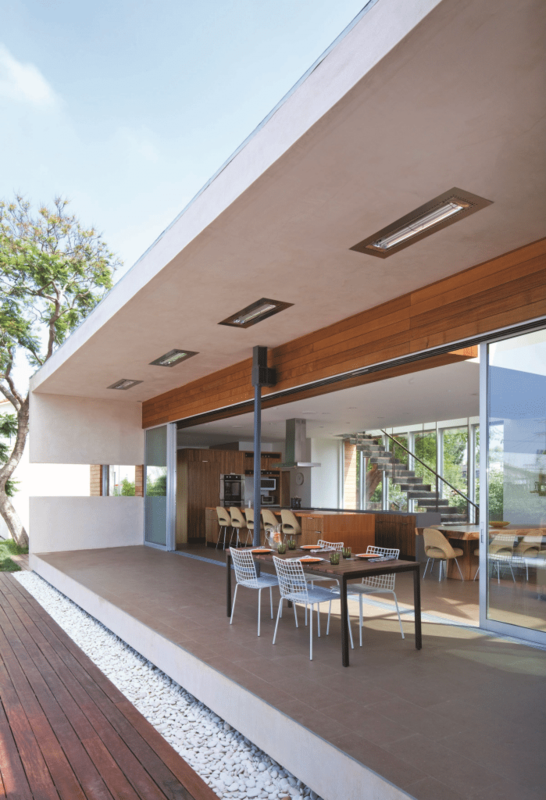 A solar chimney also draws the hot California air up and out, while the layout – which includes windows on at least two walls of each bedroom – takes full advantage of natural cross-ventilation. 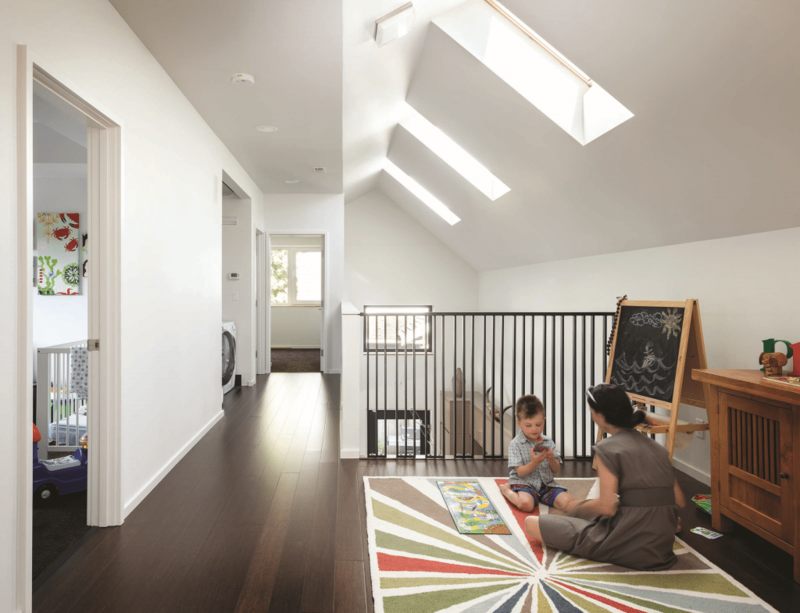 Flooring: Because of the high traffic – two parents, four kids and multiple pets – the designers opted for hard surface flooring throughout the house to keep dust, pet hair and other particulate levels down and keep the look sharp. Burnt oak hardwood by DuChâteau was the material of choice because of its natural beauty, and its ability to handle heavy traffic. 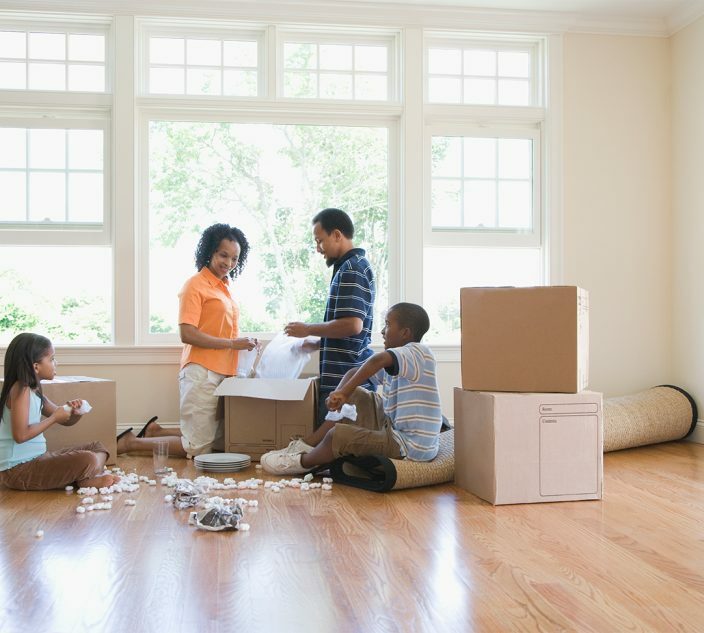 Insulation: Even though the home is located in a moderate climate, insulation helps to keep it cool on hot summer days and warm during the occasional chilly winter night. The designers chose formaldehyde-free fiberglass batt insulation, with more R-value than was necessary. Extras: Heavily influenced by their Icelandic upbringing, where they learned to revere nature and avoid waste, the architects use basic, natural materials wherever possible, and opt for VOC-free finishes as a matter of course. But to them, healthy design is about far more than low-impact materials. 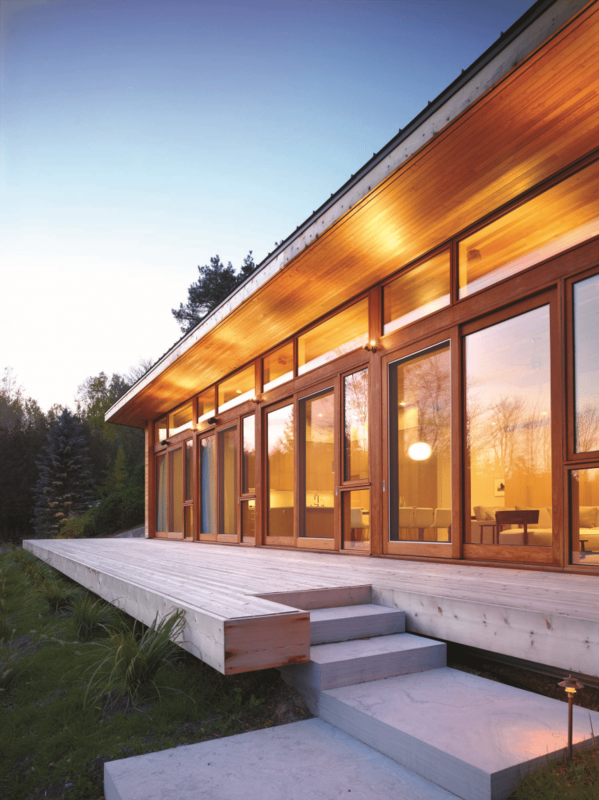 Overlooking a small pond in southwestern Ontario, this summer home is sleek and warmly inviting, and fits beautifully into the serene landscape. But what’s most impressive about the +House is what isn’t there: chemical fumes, mold, dust and other irritants. 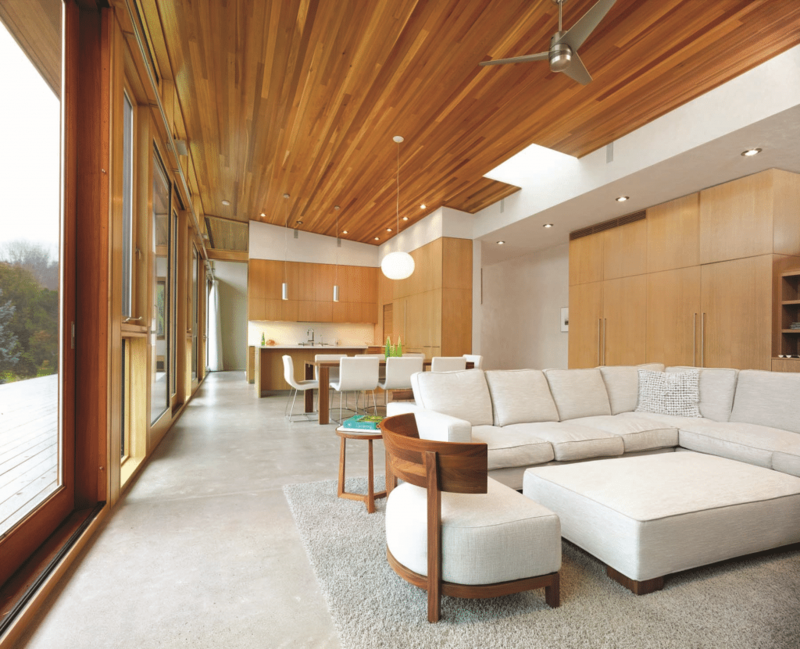 Renowned Toronto architecture firm Superkül designed the home for a client with serious environmental and chemical sensitivities, so it had to be completely free of many substances found in everyday building materials – formaldehyde, VOCs, toxic adhesives and more. Most of the products brought into the new home were first tested by the client, and if any symptoms arose, the designers and contractors went back to the drawing board. The designers also took a pass on many “green” materials that were made from recycled content, since some can cause trouble for those with sensitivities. As much as possible, they stuck with first-generation materials. Heating/Cooling/Air Filtering: In order to minimize dust and mold, Superkül opted for a radiant system in the concrete floor slab, which is regulated by a geothermal loop running through the nearby pond. There is a duct system for when air conditioning is needed during hot spells, and a whole-home HEPA filtration system, but most of the cooling comes courtesy of Mother Nature, as the house is designed for superb cross-ventilation. The designers also kept horizontal shelves, windowsills and other dust collecting surfaces to a minimum. Flooring: The floors are exposed concrete, but not the kind you would find at your local big-box hardware store. Instead, the designers ordered a custom concrete mix that had no fly ash (a by-product of coal power plants) or ingredients such as chemical plasticizers. For a final finish, they used a VOC-free sealant by AFM Safecoat. 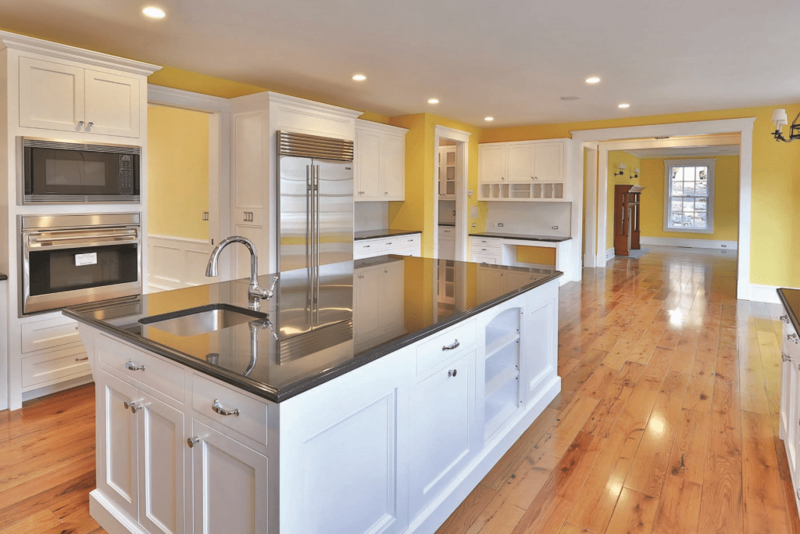 Cabinets and Counters: The cabinetry proved to be one of the project’s biggest challenges, because solid wood can warp, cup or shrink, but many types of plywood contain potentially problematic glues and binders. So the designers tested 44 different types of plywood bases (or substrates) before deciding which was best. They then chose a white oak veneer, and sealed the cabinets with a VOC-free sealant by AFM Safecoat. Wall Finishes: There is no drywall anywhere in the house. Rather, the walls are made from blocks of a concrete product called Durisol, which comes ready-made with insulation on the exterior. On the interior walls, the designers opted for American Clay finishes – not only for their soft, earthy look, but because they allow the walls to breathe, which in turns helps regulate the humidity; the finishes also help inhibit the formation of mold. The ceilings are clear cedar with an AFM Safecoat sealant; for the showers, porcelain tile was the material of choice. Insulation: The insulation came attached to the Durisol Wall blocks, and was a Roxul-type material (a popular mineral wool-based insulation with excellent insulative and sound-deadening properties). It didn’t test as Well as other materials with the client, but because it would be on the exterior of the house and encased in concrete, it was deemed safe. In other areas, a soy-based insulation was used. Extras: There are so many extras to the +House, but the most visible is the green roof, which melds the house with the sloping landscape, encourages wildlife, and helps with storm water management. Of course, one small mistake by a sub-contractor who used the wrong material, even the wrong sealant, could have botched the entire project. So when the house was complete and the client walked through it for the first time, the designers and workers were holding their breath. “Everybody was just kind of waiting. She was walking around, she was appreciating the view and the architecture and the detail – and she wasn’t commenting on anything else,” says architect Andre D’Elia. Have a healthy home idea? Write to: editor@allergicliving.com.